You can now race monster trucks with no brakes, infinite boost, and moon gravity. 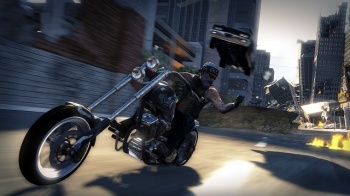 The next time you pop MotorStorm Apocalypse into your PS3, you'll be prompted to download an update via PSN. Sure, it's another download for Sony's update-happy system, but this one seems far more substantial than most. Perhaps the biggest addition, the Game Mode Editor allows you to, well, edit game modes. Are you craving a more traditional racing experience? Turn off vehicle attacks. Sick of driving those tiny, pansy vehicles? Monster trucks galore! It's really up to you. Players can now customize vehicles and upload the results to motorstorm.com, making them available for download to the game's community. If you're artistically inept or just plain lazy, this might be your only key to a cool, custom ride. In response to player feedback, Sony and developer Evolution Studios made improvements to both online play and stat-tracking. The gambling system, for example, now rewards the winner when a rival disconnects. Lobbies can now be made private, requiring an invitation. Also, the community website now features a mobile version, which is updated to include more statistics and recent player activity. Apocalypse now has motion control support, so if you've been looking for another excuse to break out the Move controller again, go nuts. Several Logitech steering wheels were also made compatible with MotorStorm Apocalypse, including the G25, G27, Driving Force GT, and Driving Force Pro. Now go make a sweet monster truck skin so I can promptly steal it.